Based on AVG Automation’s incredibly easy to use software packages, the uWinSS is no different. uWinSS Simple SCADA Software is designed to put simple, robust and easy to use SCADA control at your finger tips at a very low cost. Whether a simple Human Machine Interface (HMI) application, or a complex and demanding data acquisition and reporting mechanism, uWin SS can be adapted to your needs and requirements. uWinSS offers the user unlimited number of tags in their program, as well as no restriction on the number of screens that can be programmed! 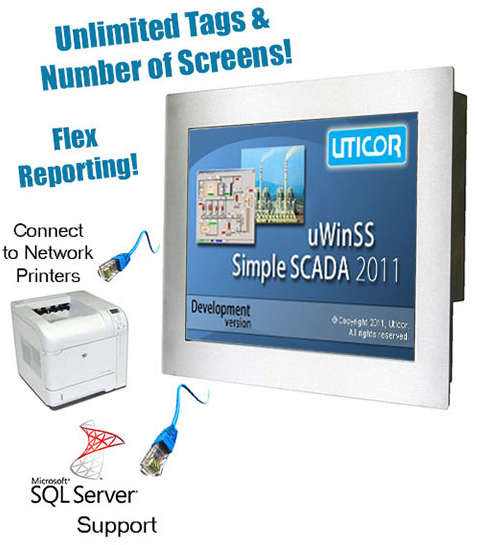 With the ability to connect to most Serial and Ethernet PLC drivers, as well as the ability to function over dual PLC protocols, the uWin software is incredibly versatile and adaptable to any SCADA application. The included Flex reporting allows the user to generate text reports based on events or data collection schedules. In addition, connect seamlessly to any network printer or SQL Server. 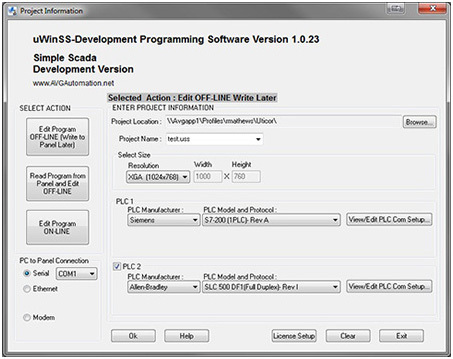 By pairing uWinSS software with one of Uticor’s Windows 7 Embedded PCs, uWinSS SCADA is enabled to communicate to higher level network PLC Protocols such as Allen Bradley’s DataHighway Plus/Remote IO, Siemens Profibus, Devicenet, Modbus Plus, and CC-Link.